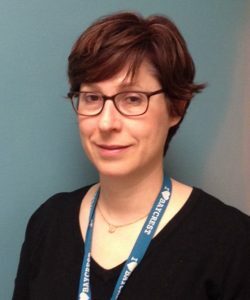 Dr. Cindy Grief, MD, FRCPC is a Geriatric Psychiatrist at Baycrest Health Sciences in Toronto, where she is the Medical Director for Mental Health Services. Her clinical roles include inpatient and outpatient psychiatry. Bereavement is a particular area of interest, which prompted her to complete a Master’s of Science degree in Medical Anthropology. Dr. Grief is an Assistant Professor at the University of Toronto. She is also a graduate of the Centre for Faculty Development’s Education Scholars program (UofT), and has played active roles in postgraduate and continuing education. Dr. Grief is part of the National Leadership Team for the Fountain of Health Initiative, which promotes knowledge transfer in Optimal Aging. Dr. Grief is currently developing a national education program in geriatric mental health (GeMH) for health care professionals using varied education technologies including videoconferencing, webinars and simulation.